Alfred Emmett was born in 1891 at Hamilton to Frank De La Warr Emmett and Kate Cannon. Frank was born in Hobart in 1846 and he and Kate of Castlemaine married in 1874. A daughter Laura Kate was born the following year. By 1878, the Emmetts were living in Hamilton. Second youngest of the family, Alfred Emmett was born there in 1891. At some point after the family moved to Mt William and later the Hopetoun district, however, one son Frank remained, residing in North Hamilton. At the time of his enlistment, Alfred Emmett was living at Boinka in the Mallee with his parents. He enlisted at Ouyen in March 1915 but was found medically unfit on June 1915 and discharged. His older brother Arthur enlisted in July 1915 and left Australia in November. Alfred tried to enlist again on 7 April 1916 at Ballarat and was successful. He left Australia during May 1916 with the 39th Battalion C Company. 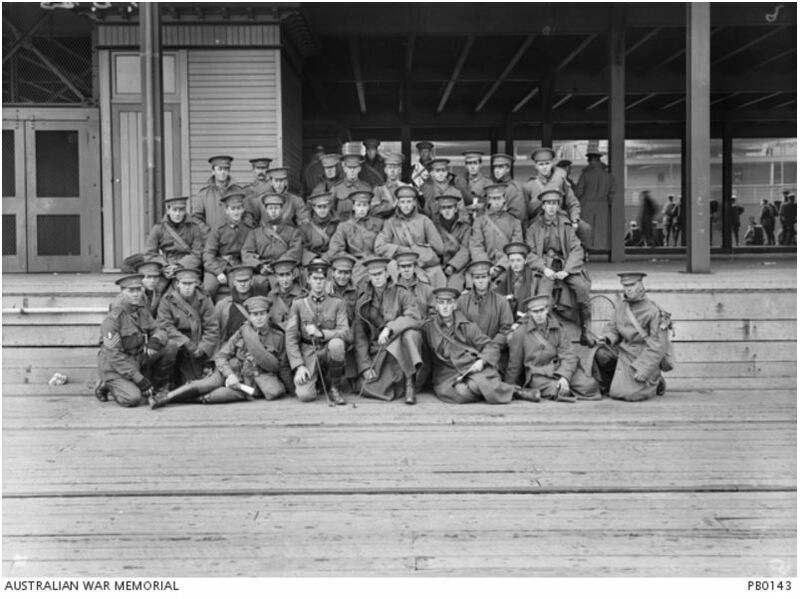 Members of C Company photographed below prior to their departure from Melbourne. On Sunday 17 June, the HMAT A11 Ascanius arrived at Cape Town, South Africa. Alfred described the sight of coming into the pier in a letter to his mother published in the Ouyen Mail on 9 August 1916. They disembarked and marched through the streets and into the country to a small village where they played sports including football and mixed with the villagers. On the morning of 19 June, the men rose early and saw some of the “wilds” of Africa and enjoyed a cup of tea at Prime Minister Louis Botha’s country residence. Alfred wrote of seeing a lioness, tiger, ostriches, a mob of buffalo, two emus and a mob of deer. An accompanying note from the Ouyen Mail suggested those animals were most likely in Botha’s private garden. 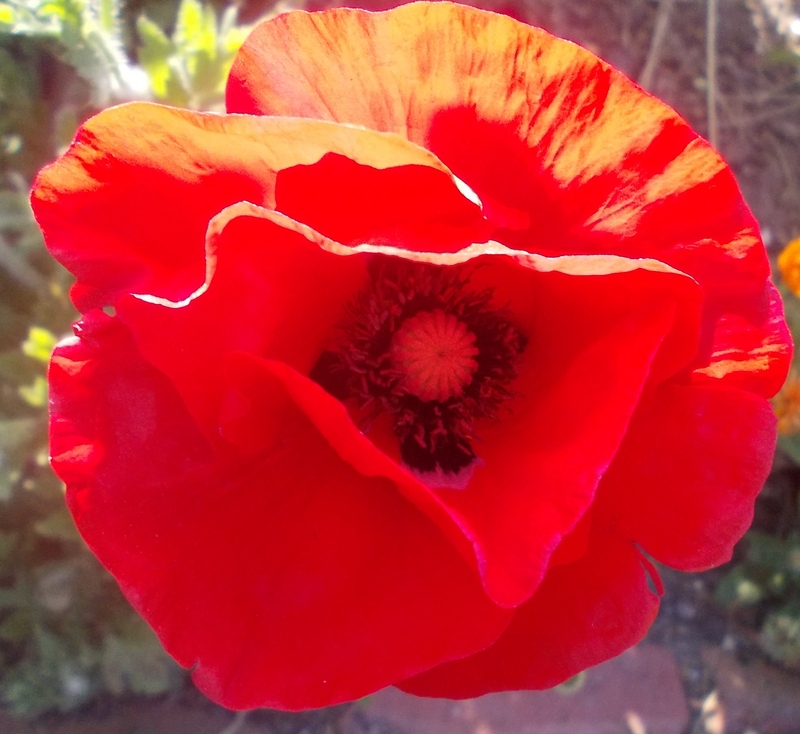 Soon after Alfred arrived in England, his brother Arthur was reported missing in action on 26 July 1916 at Pozières. Alfred was hospitalised in England with rheumatism in September and left for France during November 1916. 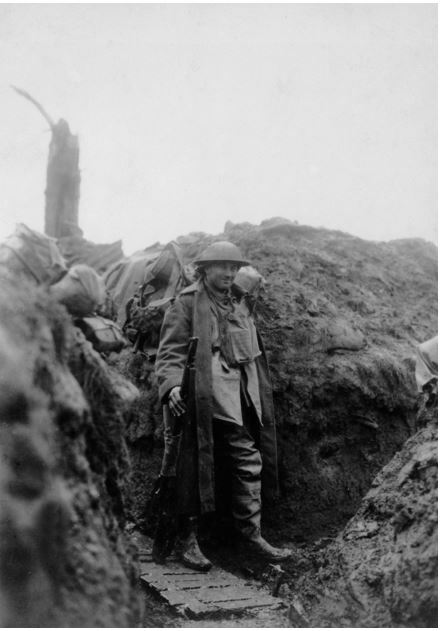 The 39th Battalion was at Houplines in northern France by 2 December and six days later in the trenches with a long cold winter ahead. Alfred was sick with mumps on 14 December and hospitalised but by 4 January 1917, he had contracted rheumatic fever and remained in hospital. He didn’t return to the battalion until 14 January 1917. On 30 January 1917, Alfred was promoted to Lance Corporal and soon after Acting Corporal. On 29 April 1917, the 39th Battalion was at Ploegsteert, Belgium. The enemy artillery was active in the morning and two men from the 39th were killed, one being Alfred Emmett. An article was published in the Hamilton Spectator on 12 May 1917. Confirmation of Arthur’s death at Pozières on 26 July 1916 had only been received three weeks earlier, so news of Alfred’s death came as a double blow to the family. “Hamilton Spectator” Hamilton Spectator (Vic. : 1870 – 1873; 1914 – 1918) 12 May 1917: 6. Web. 22 Mar 2016 <http://nla.gov.au/nla.news-article119849429&gt;. 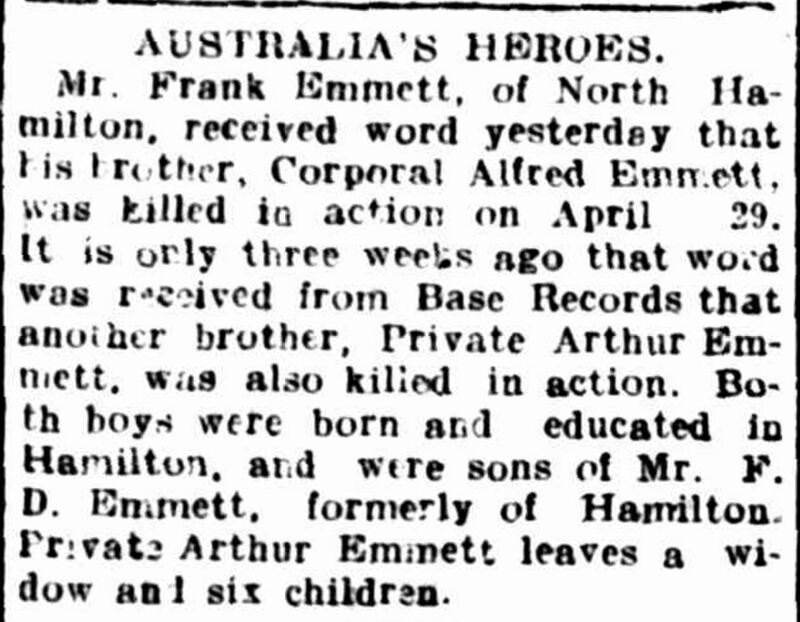 In August 1917, a son of Frank Emmett Jr of North Hamilton planted a tree for Alfred along Hamilton’s Anzac Avenue. By 1921 Frank and Kate Emmett were living at The Lilacs, Campbells Creek. On Saturday 11 March 1939, Frank and Kate celebrated sixty-five years of marriage. Frank was ninety-five and Kate, ninety-one. Frank died at Armadale in 1942 aged 96. In 1965, John Spencer a great-nephew of Alfred and Arthur Emmett, contacted the Army Records office as he was researching his family tree and found that his great-uncles had served during WW1 and was requesting further information about them.